Are you suffering from incessant toothache? Is your tooth decayed or hollow? Or do you have a broken tooth that is embedded in your gums? For any of these problems you need to schedule an appointment with a dentist for immediate treatment. There are various types of oral care options available for different oral problems. These range from simple treatments to complicated cosmetic dental treatments. We shall look at all of them later, but in this article, I would like us to focus on dental extraction. An orthodontia treatment to create room for other teeth. Infection of the tissues and bone that support the tooth. To limit risk of infection when your immune system is compromised as a result of organ transplant or when you are undergoing chemotherapy. Tooth extraction takes two forms i.e. simple extraction and surgical extractions. The former is performed on visible teeth on the gum under local anesthesia. However, due to an accident, you may suffer broken tooth that disappears beneath the gum. For this to be removed, some complicated surgical procedure has to be performed under general anesthesia. Before the tooth is pulled, your dentist will give you an injection of local anesthesia so that the area from which the tooth is to be removed is numbed. If more than one tooth has to be removed or if the tooth is impacted then the dentist will administer general anesthesia. For an impacted tooth, gum and bone tissue surrounding it must be cut away. 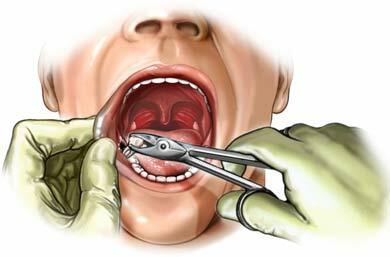 Using forceps, the tooth is grasped and rocked back and forth gently in order to loosen it from the jaw and the ligaments holding it in place. Sometimes such a tooth may be removed in pieces. After the tooth has been removed, a blood clot forms in the socket. You will be given a gauze pad to bite down on the gap so that bleeding may stop. A few self-dissolving stitches may be used to seal the gum area from which a tooth has been extracted. If the clot in the socket breaks loose, you will suffer a painful condition known as dry socket. This is prevented by placing a sedative over the socket for a few days as a new clot forms.